Historian Jim Davidson continues his lecture series about the lives of the Lindbergh family. 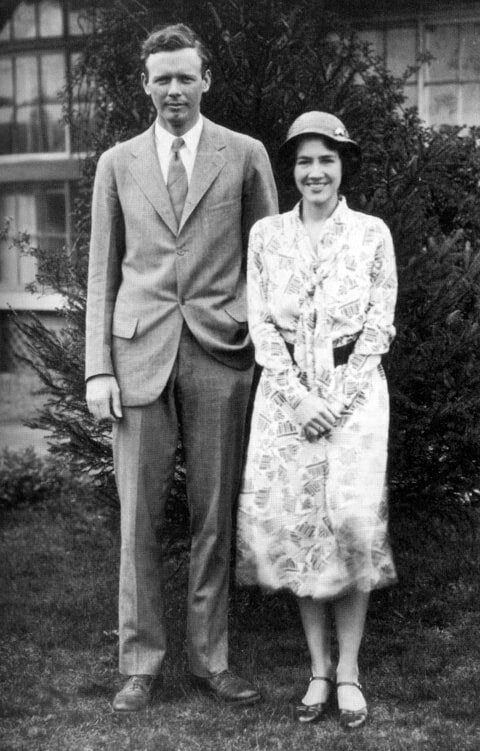 Anne Morrow Lindbergh is well known for having been the wife of pioneering and controversial aviator Charles Lindbergh. She was the mother of their six children, including their young son Charles Jr., who was kidnapped and murdered in 1932. This presentation will cover her privileged New Jersey upbringing, a whirlwind life in the spotlight, troubled marriage, retreat to Europe, and even pre-war Nazi connections. Often overshadowed by her famous husband, Anne Lindbergh was an accomplished aviator in her own right and was a noted author, having received numerous prestigious honors and awards in recognition of her contributions to both of those fields. Her many written works included poetry, fiction, and non-fiction, culminating with Gift from the Sea, which became a mainstay of many American women. She was a woman of her time and is relevant to ours. Jim Davidson is president of the East Amwell Historical Society (eastamwellhistory.org), a member of the township’s Preservation Committee, and a driving force behind the new East Amwell Museum. He also served 15 years on the Hunterdon County Cultural & Heritage Committee. A lifetime Hunterdon County resident, Jim is a former history teacher and an avid collector of Lindbergh memorabilia. Mindfulness is the practice of pausing, slowing down, and observing our internal experience - thoughts, emotions, physical sensations, action urges, and our external experience. It opens a connection to what is going on around us in the present moment. In this session participants will experience at least three ways to integrate mindfulness into your daily lives, with a special emphasis on mindful (vs. mindless ) eating. You will also receive information on reading material and other mindfulness resources. Our culture values multitasking and speed, yet we often feel overwhelmed, tense, and exhausted when we constantly do several things at once. We may sometimes feel as if we are on automatic pilot, disconnected from our bodies, minds, and emotions. When we practice every day activities mindfully, such as breathing, moving, and eating, we feel more connected with ourselves and our world, more focused, satisfied, and accomplished. Michele Naphen, MSW, LCSW, has studied and practiced mindfulness since 1987. She teaches mindfulness skills privately, and in the Adult and Women's Trauma Intensive Outpatient Programs for Princeton House Behavioral Health in Hamilton. Michele has participated in trainings and retreats with leading mindfulness teachers, including John Welwood, Ph.D, Jon Kabat-Zinn, Ph.D, and Dialectical Behavior Therapy trainers. Elaine Buck and Bev Mills, authors of the new book If These Stones Could Talk, continue to share stories of their journey uncovering histories of the African American community in the Hopewell Valley, Sourland Mountain, and surrounding regions of New Jersey. In her foreword for the book, Emma Lapsansky-Werner, Professor Emeritus of History at Haverford College, writes, "Elaine and Bev’s story is about both race-based pain and interracial triumph; it’s about pettiness and greed and prejudice and ignorance and exclusion. But it’s also about teamwork and mutual human concern, and about the intricacies of family life among and between White and Black Americans, stretching from the eighteenth and nineteenth century into the twenty-first century. ... Here, in a narrative that is partly memoir, partly detective story, the reader meets a fascinating parade of characters." Trustees of the Stoutsburg Cemetery Association, and co-founders of the Stoutsburg Sourland African American Museum (SSAAM), Beverly Mills and Elaine Buck began collaborating over a decade ago researching the lives of their African American ancestors who resided in the Sourland Mountain region and surrounding areas. After many years of research, examination of records, deeds, church records, and collection of oral histories, Mills and Buck published their book in November 2018. The Hopewell Public Library's Wednesday Night Out series is held on the first Wednesday of each month. These events are free and open to the public – no registration is required. Due to the size limitations of the library building, these talks are usually held at the Hopewell Train Station or the Hopewell Theater. We will be trying a new approach, using a common ingredient -- lemons -- instead of a common cookbook. Let the creative (citrus) juices flow! Advance registration is requested. For more information and updates see the Book Clubs page on the HPL website under the Activities & Events menu, and the website Calendar. Open to all interested seniors. Join a supportive, non-critical group especially for seniors who are looking to explore life experiences through writing. This is an excellent way to record memories for friends and future generations, make connections with other writers, and revisit formative experiences in a nurturing environment. All levels of experience are welcome. The Senior Memoir Class will have a series of regular meetings to work on literary forms of autobiographical memoir, "miro" memoir, and brief personal essays. This is a non-critical workshop where students will explore the slippery nature of memory, study examples of memoirs, and experiment with imagery and symbolism to bring their stories to life. Students will write their own pieces outside of class for sharing and light workshopping during class sessions. Discussion will focus on shared resonance and helping to develop clarity in writing style. Debra Liese (MFA) is a mother of three, publishing professional, certified educator, and occasional essayist. She has taught writing for children and adults at the Arts Council of Princeton, and started a memoir class for seniors via the Princeton Senior Resource Center. She has special interest in children's literature and therapeutic writing.